On August 18 we were told that our dossier is on its way to China! It means that after gathering mounds of paperwork, we had it notarized and then I waited for an hour (or so) in Natalie Tennet's office to have it "state sealed." We sent it to our agency, who reviewed it - then they sent it to Washington D.C. and the Chinese Embassy. From there, the Chinese Embassy stamped and approved it. We had been waiting for about two weeks to have to be sent from Washington D.C. to China. On August 18, we received word from our agency that it was on it's way. It should arrive in China within a week. As you can see, we have been moving along - but still have a little ways to go. The next big step is the "referral." 1. We will be listening in on a conference call (around the first of September) with our agency. 2. Once our dossier is officially LID (logged in date) in China, we will be officially on the waiting list for a child. Currently there are 24 families with our agency that are on that list. Typically the wait time, for a little girl from China is listed as a 6-18 months. We, of course, are hoping for a much sooner wait time, but anticipating it to be at least six months. In the meantime, we still need to be taking classes and reading books. Because we are open to quite a few medical needs, we are hoping to be matched sooner. 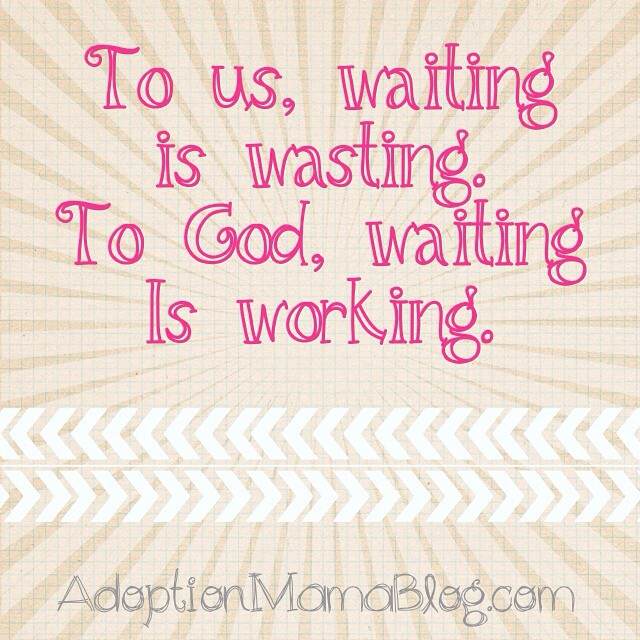 Our family is learning so much about waiting and God during this process as well. 1. We will have patience as we wait for just the right referral. 2. We will seek wisdom from God, doctors, and family when we receive a referral. 3. Keep our eyes focused on God during this special waiting period. 4. For our daughter - that she will feel loved and that her medical needs will be taken care of. Thank you for loving our family and coming alongside us as we take this unique journey.